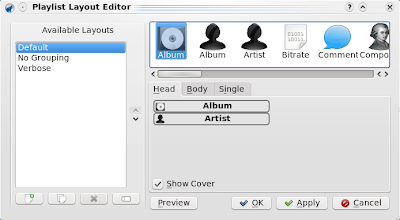 One of the new additions which are noteworthy to mention for Amarok 2.1 is the introduction of the classic playlist (the one from 1.4) and also the playlist editor. The playlist can still be a mess, with songs from albums mixed throughout the entire playlist or compilations which are shown separately for each individual artist. 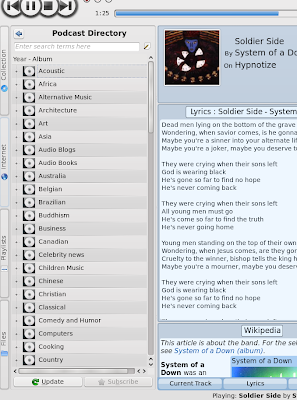 Still, there is no keyboard shortcut to search through the playlist (like Alt+E in Amarok 1.4). There is now an Update Collection option under the Tools menu, just like in 1.4, so you won't need to rescan the collection each time you add some new music to it. The interface is more appealing now, and the blue really looks very good. 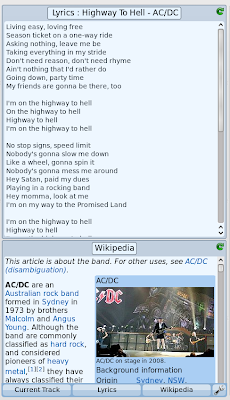 The central widget is better organised now, offering easier access to lyrics or Wikipedia information. Amarok 2.1 comes with 7 different internet services, including Jamendo and Magnatune music stores, Last.fm integration and Podcast Directory. The podcast directory integration is really great and useful, and it will fetch large lists of podcasts from various domains. Notice that you'll have to drag the selected podcast in order to add it to the playlist (although good functionality, this should be available in a context menu too when right-clicking the podcast). Also, for me every podcast refused to play, and Amarok issued the error "Too many errors encountered in the playlist. Playback stopped". Adding a large number of podcasts can make it freeze and render it unusable. The Last.fm integration is very good, and it provides your profiles information directly inside Amarok. You can listen to Last.fm radio, submit the tracks you are playing, see neighbours and friends (and play their personal radio), love and skip tracks. I noticed Amarok won't fetch covers from local folders, and the Amazon cover fetching seems to be pretty poor. Also, I have albums with names which go like Dark Side of the Moon [Twentieth Anniversary Edition] or Let There Be Rock [2003 Remaster] and the covers are not retrieved for those ones. This is where local cover fetching would be very useful, just like in 1.4. Bottom up, Amarok still lacks several major features, not to mention usability, but it's obvious that 2.1 has made some progresses compared to 2.0. There is no equalizer, many bugs, the playlist can get a little messy. As most of Amarok's fans know by now, Amarok 2.x can't be compared with 1.4 in terms of features yet, but (hopefully) these will be implemented. It's just that it takes way too much time. I just installed 2 on my KDE4 setup. I thought it would be usable. I can't stream music without it skipping every time switch tasks. Maybe I should use kplayer. Is it a Phonon problem? Now I understand all the complainers. It can't even stream. WTF? I just want a simple player that plays almost any format and can stream. I don't care about the gay collection, meta data, bull sh1t. WTF? through this rough time all over again. just basic stuff like security fixes, just until 2.x will catch up. Sounds like another Linux software nightmare . . .
How does version 2.1 somehow restore features from version 1.4? I may be an educated computer science student, but this is simply stupid. After being a Linux user/programmer for 5+ years, I must thank Linus Torvalds. Linux has become a nightmare from hell, because he ignored the most basic rules of computer science. It's too late now for Linux -- HA HA. Windoze is a garbage OS and now Linux is also -- HA HA. well, Amarok 2.0 may be lacking some features but amarok team has done an amazing job till now, IMO. Have you seen video integration that is to arrive in later versions? just amazing. There's obviously some things like not having devices management that are quite annoying; but overall I'm impressed. Look banshee, you CANNOT delete music form your ipod. at least I could find any option, and this on purpose not a feat7ure not implemente yet. Anyway, I don't understand such terrible reviews of the UI. Have you all seen GTKipod or rythembox? I don't even know what's in a platylist, a device or my collections.Terrible UI. Amarok is much cleaner, and now, the old 1.4 design belongs to 90's, sorry boys. @anonymous 1 - which rules? classic playlist is a good start but I also want them to put in a minimalist option where you just have a small player w/ time/song scrolling across and buttons to play/pause and maybe dock the playlist. I DONT NEED a full page apps to listen to music every time. I dont need lyrics, ratings, cover art, last.fm or other web sites. I just want to be able to listen to a few songs (sometimes just one song) without it taking over my whole work space. One of the things that I miss the most is the good MusicBrainz integration that Amarok used to have until 1.4. It was a great tool to fix the tags in some songs that either were not ripped correctly or had their tags messed up somehow. 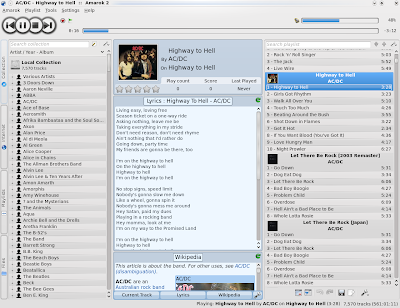 Funny thing is that Juk, which is a much simpler playlist based music player and is actually a default application shipped with KDE, brought along its MusicBrainz integration after the jump to Qt4. One wonder if it is not just a matter of borrowing the code from Juk, refactoring the old code from 1.4 or if it is just not at the top of the devs priority at the moment. I am trying to live with the new UI and am somewhat comfortable with it now, but it is still a bit unstable. Sometimes widgets (specially the top level menus) stop responding mouse clicks after a couple of hours playing songs non stop and Amarok has to be killed. 2.2 should catch up a little, now that remote MySQL will return. Lack of SQL support kept me on the old 1.4 version. Amarok 2 finds the cover art I have stored locally in the directories where the tracks live. If you have tracks from multiple albums in a single directory, and a single image file for the cover art, it should use that for all the albums in that directory. If you have multiple images in the directory where the tracks live and expect Amarok to choose any one, much less the correct one, it's probably not going to happen. I love Amarok 1.4, The only thing I hated, related songs in the now playing window, if your double click on it, told "it's already in the playlist". To which I said, for goodness sake, done this 500 times, I want it to play, lol. Dumping complete 1.4 support in parallel (you can't install 1.4 on Mandriva Spring if you have 2.x) and get it to work (well, I tried for about an hour). How can you possibly release a "new" version with no MP3 player support. They are estimating 4Q09 for alpha USB mass storage MP3 player support!? I loved it, I used it, I sold others on Linux demoing it, and have now had to become a SongBird expert because, (I don't know about iPods) it has all the same features (not as integrated, all plugin based, is a lot slower) as 1.4 and guess what, you can sync music to your MP3 player. Seriously, and every time I asked this question on forums BEFORE KDE was "cooked", it got deleted. If you use 1.4, have an MP3 player, stick with 1.4. Don't forget labels! They still haven't been re-implemented. Labels rock! I meticulously tagged my entire collection with labels, and all my playlists are auto-generated from them. I can't move to 2.x until they come back.